Dwight Rhoden's Complexions Contemporary Ballet makes its Pittsburgh debut. For years now, Pittsburgh dance audiences have seen the choreographic works that Dwight Rhoden has created for Pittsburgh Ballet Theatre, works like 7th Heaven and 2009's Step Touch. Now, courtesy of Pittsburgh Dance Council, Rhoden at last brings his own Complexions Contemporary Ballet, featuring dance superstar and company co-founder Desmond Richardson, to the Byham Theater on April 3, for its Pittsburgh debut. The diverse company that celebrates dancer individuality along with superior artistry is in its 15th season -- a milestone for a troupe that has seen its share of ups and downs. "The most satisfying part of this journey has been seeing our dreams realized," says Richardson, by phone from New York City. "People saying, 'Perhaps you should stop,' and you keep moving forward. Now we are selling out around the world, and that has to mean something." What it means is that audiences have taken to Rhoden and Richardson's full-tilt, dizzyingly dense and athletic choreographic styles, as well as Complexions' ferociously talented dancers. Consequently, Rhoden and Richardson have been asked to choreograph for, and be celebrity judges on, So You Think You Can Dance, a similarly popular television show in Australia, and Italy's mega talent show Amici. 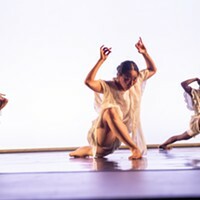 In the 90-minute, three-act program Complexions brings to Pittsburgh, the company will present seven repertory works: six by Rhoden, plus Richardson's trio "Fall" (2008). "My inspiration for the work was sculpture and the lyrical movement of water," says Richardson. "We were in St. Thomas on tour and I heard the crashing of the waves and immediately saw three women as muses." A former principal dancer with Alvin Ailey American Dance Theater, Richardson is known less as a choreographer than for his otherworldly skills as a dancer. In "Fall," he also co-wrote and sung the music the work is performed to. One of his muses in "Fall" is former Pittsburgh Ballet Theatre dancer Patricia Hachey, who says she has found renewed life in her career with Complexions. "I feel at home in the company," says Hachey via phone from New York. "I have grown a lot technically and artistically in my two years with the company, and I think I am a better dancer for it." Hachey says her move to Complexions took some getting used to, especially all the touring. "We dance a lot and the work is very demanding," says Hachey. 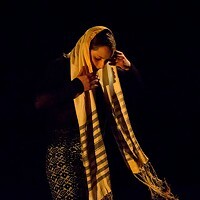 For her Pittsburgh homecoming, Hachey will also dance in the program's opening ballet, "Mercy" (2009) -- a work Richardson describes as "spiritual and thought-provoking" -- and its uplifting closer, "Rise" (2008), set to nine songs by rockers U2. Richardson's fans, meanwhile, will get to see him bare-chested in Rhoden's powerfully emotional "Solo" (1998), with music by Prince.